This is a FREE BLUES Jam and open to all blues musicians! 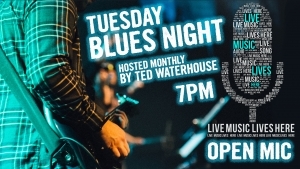 The Real Blues Jam (SouthWest) will be cookin’ up some serious blues at The Siren in Morro Bay once a month (*subject to The Siren’s ticketed concert schedule with touring acts) & will be hosted by Ted Waterhouse on Guitar, Slide Guitar & Vocals, Brucifer Willard on Bass, and daring Dean Giles on drums. Don’t miss the chance to play Real Blues with a solid band in a professional room with world class sound engineering and lighting. All musicians welcome regardless of experience. The only requirement is a focus on the Blues, Chicago, Delta, Jump or otherwise. Just get your name on the signup sheet and be patient and we promise to get you on stage for at least three tunes. (Note that it is Strongly preferred that guitarists use the guest amp – a killer vintage 1965 Fender Delux Reverb and please no parking of gear in the rear hallway!) Over the years the Real Blues Jam has attracted professional musicians who just want to have fun with their craft, Novices who want to experience playing and singing live with a solid band, and Music Lovers who just want to dance, have fun and support local, live music.